With just over four months until the biggest names in world basketball descend on Melbourne, Popovich spoke to the prospect of playing in front of 100,000 fans at Marvel Stadium. “When I found out about that (the crowd) I was just shocked at the number of people that will be there (Marvel Stadium). With the 2019 FIBA Basketball World Cup to be contested in China August 31 – September 15, the USA will play two games against the Boomers in Melbourne as both teams finalise their preparation for the world championship. While final World Cup rosters are yet to be selected, it’s expected that both countries will be represented by their NBA stars as reflected in the new event creative unveiled today. Harrison Barnes (Sacramento Kings); Bradley Beal (Washington Wizards); Devin Booker (Phoenix Suns); Jimmy Butler (Philadelphia 76ers); Mike Conley Jr. (Memphis Grizzlies); DeMarcus Cousins (Golden State Warriors); Stephen Curry (Golden State Warriors); Anthony Davis (New Orleans Pelicans); DeMar DeRozan (San Antonio Spurs); Andre Drummond (Detroit Pistons); Kevin Durant (Golden State Warriors); Paul George (Oklahoma City Thunder); Eric Gordon (Houston Rockets); Draymond Green (Golden State Warriors); Blake Griffin (Detroit Pistons); James Harden (Houston Rockets); Tobias Harris (Philadelphia 76ers); Gordon Hayward (Boston Celtics); Kyrie Irving (Boston Celtics); LeBron James (Los Angeles Lakers); DeAndre Jordan (New York Knicks); Kawhi Leonard (Toronto Raptors); Damian Lillard (Portland Trail Blazers); Kevin Love (Cleveland Cavaliers); Kyle Lowry (Toronto Raptors); CJ McCollum (Portland Trail Blazers); Khris Middleton (Milwaukee Bucks); Victor Oladipo (Indiana Pacers); Chris Paul (Houston Rockets); Isaiah Thomas (Denver Nuggets); Klay Thompson (Golden State Warriors); Myles Turner (Indiana Pacers); Kemba Walker (Charlotte Hornets); John Wall (Washington Wizards); and Russell Westbrook (Oklahoma City Thunder). With a record 13 Australians playing in this season’s NBA, for the first-time ever the Boomers could feature an all-NBA line-up including Deng Adel (Cleveland Cavaliers); Aron Baynes (Boston Celtics); Jonah Bolden (Philadelphia 76ers); Andrew Bogut (Golden State Warriors); Ryan Broekhoff (Dallas Mavericks); Mitch Creek (Minnesota Timberwolves); Matthew Dellavedova (Cleveland Cavaliers); Isaac Humphries (Atlanta Hawks); Joe Ingles (Utah Jazz); Thon Maker (Detroit Pistons); Patty Mills (San Antonio Spurs) and Ben Simmons (Philadelphia 76ers). Currently ranked No. 11 in the world, Popovich believes the Boomers are a real medal threat at this year’s FIBA World Cup. “They’re well disciplined, they’re talented, they’re seasoned and have an excellent opportunity to be very, very successful,” remarked Popovich. To date, just over 92,000 tickets have been sold for these much-anticipated games at Marvel Stadium on Thursday 22 August and Saturday 24 August. 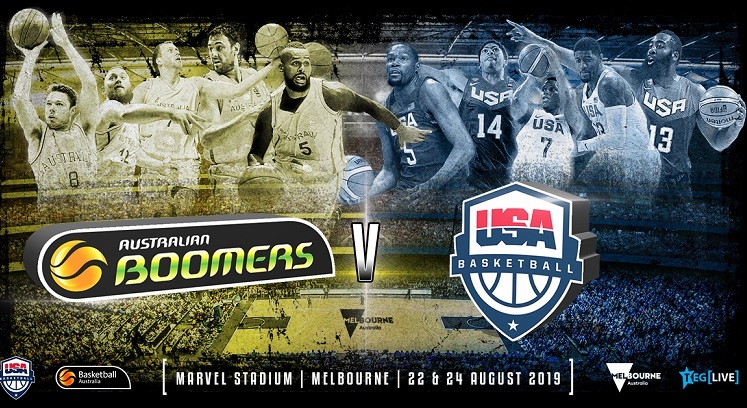 USA Basketball vs. Australian Boomers in Melbourne is supported by the Victorian Government via its tourism and major events agency Visit Victoria.